At some point in my stay, a potential five-year candidate named, Nathan Rosen, flew in from France for a short stay. I drove with Dr. Yang and Jonathan Chang to pick him up. Upon picking up Nathan, Dr. Yang treated us to breakfast. As we got acquainted with Nathan he suddenly began to choke on his food. I quickly jumped up and gave him the Heimlich maneuver and after about seven or eight heavy strokes it finally worked. Nathan exclaimed in his heavy French accent "Thank you, you saved my life,” and I was proud to have been there to help at that moment. We became good friends. I'll miss chopping down fallen trees that landed on the walking path on our walks together around the property. I also formed close brotherly bonds with the disciples and grew my relationship with Dr. Yang as well. I will always miss the training and Dr. Yang's life stories and his comical remarks. Some great skills I learned outside of Kung Fu were gardening, running an organic chicken coop, maintaining livestock, learning the basics of the Chinese language and seeing what a true Kung Fu brotherhood was all about. Dr. Yang also allowed me to practice my Shaolin Kung Fu and Wu-Su during my free time, which was a plus. Jonathan Chang also had no problem with me adding a few drills to his already intense routine. I had the chance to witness how the other disciples and visitors work out in their country. We shared training drills and showcased our Kung Fu forms to one another in our spare time, which we all benefitted from. It was also extremely interesting to live in a multi-cultural environment with others who share a common passion for Martial Science, which was truly refreshing. I had the opportunity to become friends with people from China, Spain, Chile, France, Great Britain, Switzerland and other areas of the United States. On more than one occasion Dr. Yang took us out to eat. He is a very generous Master who reminded me very much of my own Sifu, Master Kwong. Dr. Yang was always very equal and fair and treated everyone with the same respect as he affords his disciples, whom he considers his sons. We were given an equal education. I was also fortunate to be there for the arrival of Dr. Yang's own blood son, Nicholas Yang. Nicky is the president of YMAA International and one of hardest working martial athletes I have ever been in the presence of. During my stay, ESPN arrived to shoot an entire program on the YMAA retreat center and I was able to represent the center and showcase my talent for the program. ESPN filmed segments of our drills, martial training and body conditioning. The training I excelled at most was body conditioning, military style drills, work details, Shaolin Long Fist and tumbling. 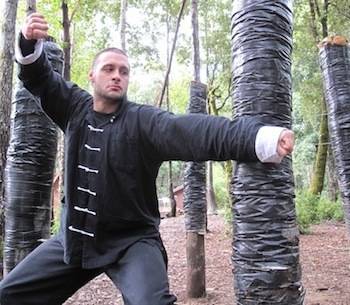 My development areas were Yang Style Taijiquan, White Crane Gong Fu and White Crane Qi-gong. Overall, it was an excellent experience and an invigorating sense of accomplishment to know that I was able to overcome any obstacles in order to complete the challenging training of Dr. Yang and his disciples. I will miss them all very much. Getting back to being the father of a beautiful one year old daughter, husband, and martial arts teacher will make saying goodbye that much easier. One thing that certainly is clear about Dr. Yang is that he truly wants his students to become exceptional martial artists. He has made it abundantly clear by his speeches that it took him over 30 years to understand the material which he was teaching and explaining to us in one training week or session. It took him those years to translate some of the ancient documents left behind from several past masters before him and he told us, "If you only become as good as me, then I have failed! You need to learn everything I have to teach you in five years, so you have the rest of your lives to learn more than me. If you learn less than me before I die, then I have failed you and the art dies, thus becoming weaker." This statement really resonated with me because I could see the sincerity in his eyes and knew he must be thinking of his past White Crane Master, Cheng Gin-Gsao, who passed away. Dr. Yang told us that when he mentioned to his White Crane Master that he was coming to America to pursue his dreams of obtaining his Ph.D. and spreading Martial Arts to the world, his Master truly wanted him to stay and learn more because he had so much more to teach. Dr. Yang still proceeded to leave for America to follow his heart but a few years later on May 5, 1976, just before Dr. Yang could return, his White Crane master sadly passed away, taking a wealth of knowledge with him. This may be what compelled Dr. Yang to keep his martial arts knowledge alive by writing so many books and recording so many training DVDs to share with the world. Traveling to Northern California for training was hard at times. In addition to missing my family and colleagues the weather was often cold and wet and training in the rain left my hamstrings sore. I lost some of the flexibility I had worked hard to obtain. I had to spend extra time stretching to keep up with my side splits. I also lost some of the definition in my abdominal muscles since the core training was less emphasized than I'm used to. I had to cease some of my personal training whenever I got a new cut or scrape on my hands and fingers due to training in the woods, rope climbing or cinder block tossing. It was also hard to resist the temptation of everyone's outstanding cooking. I gained ten pounds and had to start cooking healthy options for myself to lose the extra weight. Overall, the positive benefits of the program far exceeded my expectations and any short-term pain was worth the long term gain and exceptional experience that I had. At this point I’d like to offer recommendations for visitors or potential disciples. I’d suggest that you purchase and practice the following DVDs by Dr. Yang to enhance your martial arts training and maximize your time at the YMAA center. They will give you a solid foundation of what YMAA training is about. If you achieve this fundamental knowledge beforehand then you may have less of a learning curve for your stay at YMAA thus freeing your time to sharpen your skills and learn additional things. 1. Understanding Qigong DVD #1 through #5. 2. Shaolin White Crane Gong Fu 1&2 "Basic Training". 3. White Crane Hard & Soft Qigong "The Essence of Shaolin White Crane". 4. Shaolin Kung Fu, Volume One "Fundamental Training". 5. Shaolin Long Fist, "Basic Sequences". 6. Kung Fu Body Conditioning Volume One. If you decide to visit the center, aside from the usual toiletries, I suggest packing Dit Da Jow (Chinese bruise healing medicine), heating pads, martial arts training shoes, shower slippers, a warm hat, light fitted gloves, a windbreaker, a waterproof training jacket, shorts, tee shirts, sweat suits with hoods and a powerful flashlight. Additionally, be ready to complete facility chores as everyone chips in and is treated equally. Laziness is not tolerated. Dr. Yang receives hundreds of applications from potential students applying for the five-year program, yet he's only chosen a select group of exceptional disciples who work and train extremely hard. For now, my time at the center has come to an end due to my responsibilities at home, but next year I'd love to return to train again. In the meantime, I'll be taking my own advice by mastering the skills on the previously mentioned DVDs. If an applicant has the interest, funding and family support to commit to this rewarding program and lifestyle it’s an ideal and unique place to learn and train. Parents with teens interested in martial arts should know that in addition to the comprehensive and rigorous martial arts lessons they would also learn media production, English/writing skills, cooking, Chinese language, as well as, responsibility, focus and teamwork from the highly skilled staff. YMAA is a stellar facility that I would rate a perfect 10. I’m a full-time student of many martial arts facilities with extremely high training standards and I was thoroughly impressed by my education and experience at YMAA and am proud to have attended. In closing, I’d like to thank my new brothers from YMAA for making my stay an unbeatable experience, Frank Verhulsdonk, Javier Rodriguez, Armando Arroyo, Jonathan Chang, Eddie Newsinger, Alex Lin, Patrick Manriquez, Tye Tonkin, Nathan Rosen, and Xiao Hu! I’d like to thank Dr. Jwing-Ming Yang for allowing me into his home and for sharing his enlightening life stories, extensive knowledge of Chinese Martial Arts and secrets of Qigong with me. To contact Dr. Yang, make a donation, purchase materials or learn more about the YMAA Center please visit their web site.